Readers in Rhode Island and the surrounding area are reminded that a Solemn Requiem Mass in the traditional Roman Rite will be celebrated at 6:00 pm on All Souls’ Day, Monday, November 3rd, at Holy Ghost Church in Tiverton, R.I. The celebrant and homilist will be Father Neil J. Roy, former editor of the liturgical journal Antiphon and presently Montfort Fellow, Saint Benedict Center, Still River, Massachusetts; Father Jay Finelli (pastor of Holy Ghost) and I will assist as deacon and subdeacon, respectively. Absolution at the catafalque to follow immediately. 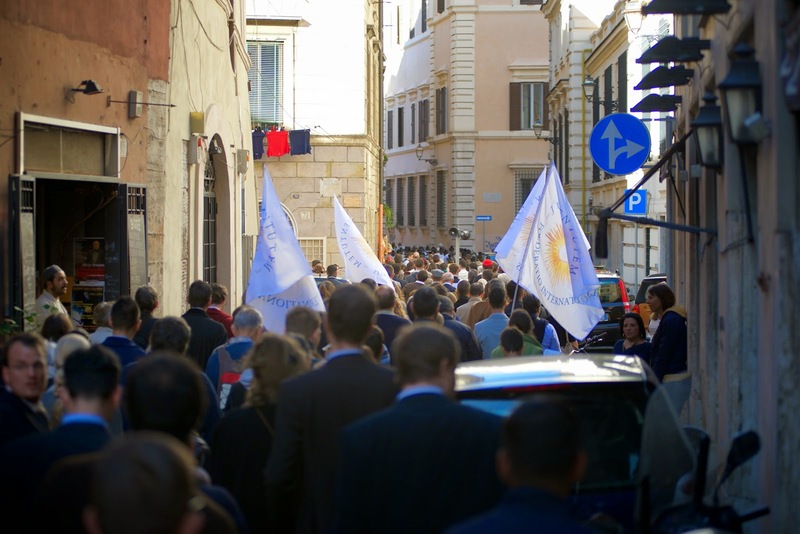 Here are a few more photographs from last Saturday’s events of the Populus Summorum Pontificum pilgrimage in Rome. The first three are from Eucharistic Adoration held in the Basilica of San Lorenzo Damaso, the fourth and fifth are of the procession which made its way from there to St Peter’s, and the rest (below the fold, as it were) are from the Mass celebrated in the Basilica by His Eminence Raymond Cardinal Burke. These come to us from Christopher Owens, who has posted the complete photostream on his website, CDO Photography, and are here reproduced with his very kind permission. This Sunday at 8:30 a.m. there will be a Sung Mass for the feast of All Souls at Immaculate Conception, Washington, D.C., according to Divine Worship, the order of Mass approved for the Personal Ordinariates. 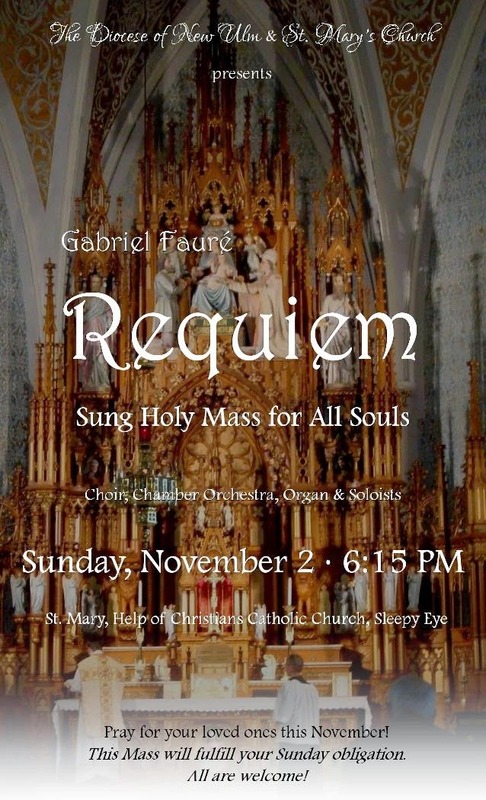 The music will be Gabriel Fauré's setting of the Requiem Mass. Next week marks the fifth anniversary of the promulgation of the Apostolic Constitution Anglicanorum Coetibus, establishing the ordinariates. All are welcome to join us as we honor and pray for our faithful departed. 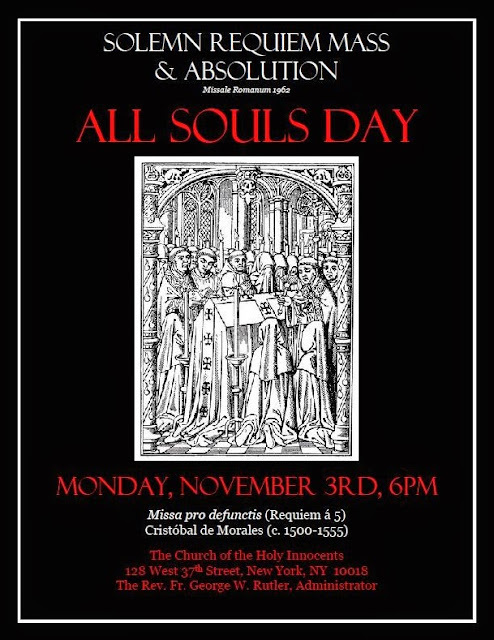 On November 3rd, 2014, the Church of the Holy Innocents in midtown Manhattan (NYC) will be observing the Commemoration of All Souls' Day with a traditional Solemn Requiem Mass at 6pm. The Choir will sing the Missa pro defunctis for five voices by Cristobal Morales. Fr. Carlos Viego will be the Celebrant of the Mass. 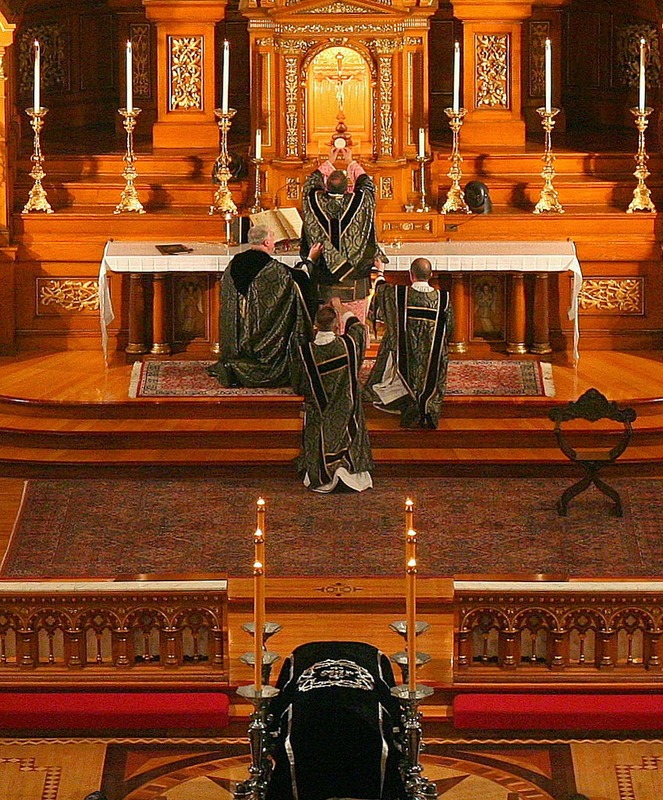 Tapers will be distributed to be lit and held at the Gospel, during the Canon, and for the Rite of Absolution. During the summer I was fortunate enough to visit this church. 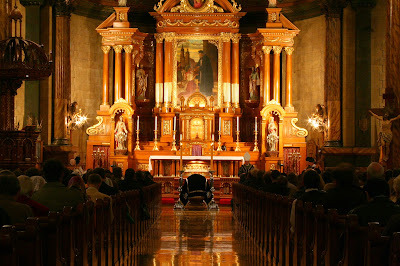 One has an immediate and very tangible sense of devotion as one walks through the door, from the centre of busy Manhattan into the presence of the Blessed Sacrament. There were many kneeling in silent adoration during Exposition and there were hundreds of devotional candles lit in front of numerous statues of Our Lady and the Saints. I took this photo on my phone while I was there and it has been my 'wallpaper' ever since. I had heard about Holy Innocents but I hadn't realised what a special place it is, and I look forward to returning there soon. Hello readers! 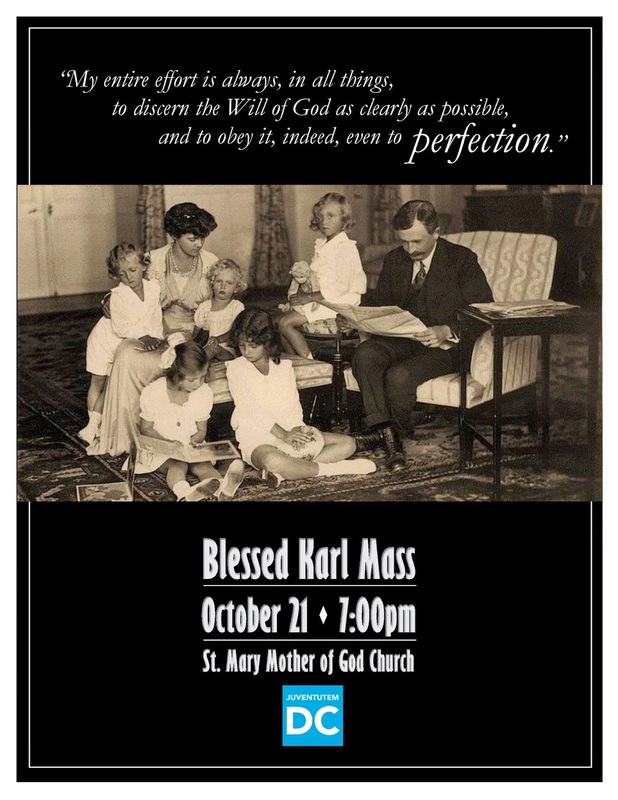 Several readers send in announcements for their All Souls Masses. Check out below to see if there’s one in your area! 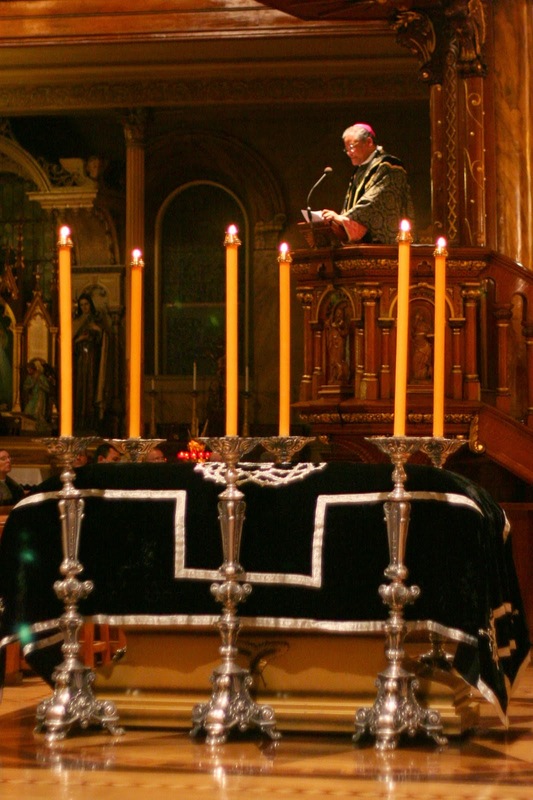 Bishop Robert Morlino will celebrate a Pontifical Requiem Mass at the Throne (EF) at the Bishop O’Conner Center in Madison, WI on Monday, November 3rd at 7pm. 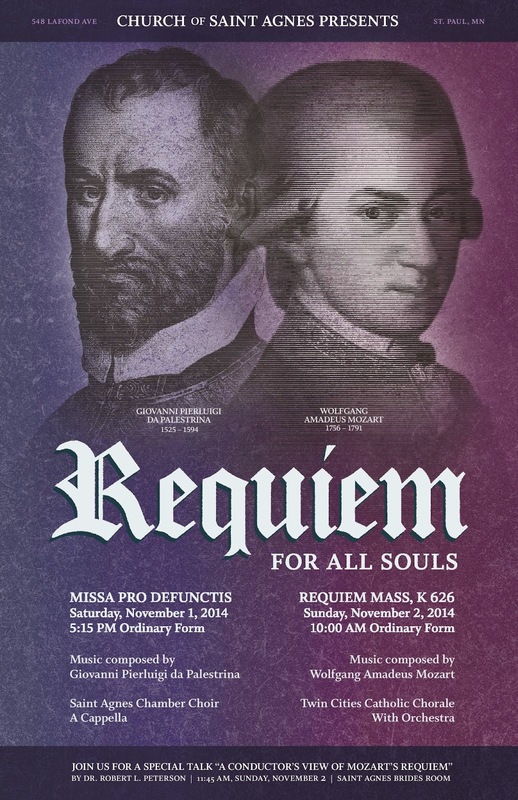 The propers and ordinary will be from Tomas Luis de Victoria’s Requiem for 4 Voices, as well as some Gregorian chant. 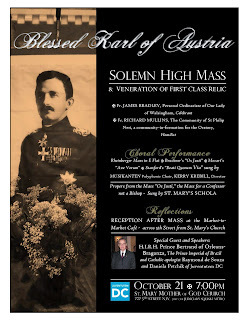 Organized by the Tridentine Mass Society of Madison, as part of an ongoing schedule of bi-monthly pontifical Masses in Madison. On Monday, November 3, there will be an All Souls’ Day Requiem High Mass (EF) at 7:00 PM at St. John’s Catholic Newman Center at the University of Illinois at Urbana-Champaign. 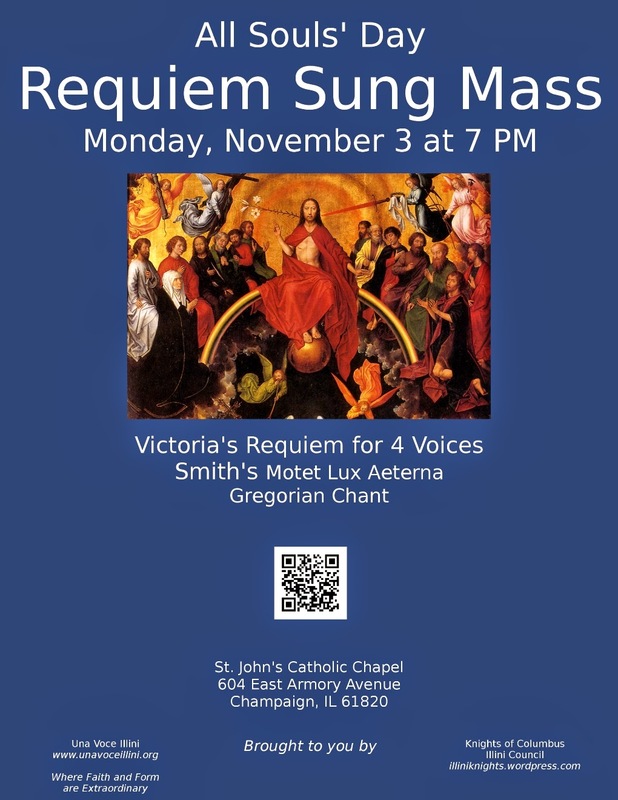 The Mass setting is Tomas Luis de Victoria’s Requiem a 4 Voices and Gregorian chant. The choir will be directed by Heath Morber and consist of students of the university. The Mass is being organized by the Knights of Columbus Illini Council and Una Voce Illini. Father Scott Archer will be the celebrant. 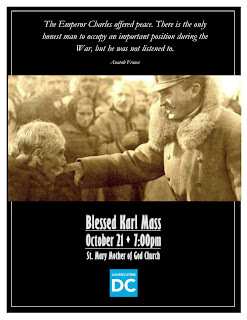 For more details on the Mass, please visit www.unavoceillini.org or the Facebook event page here. The Church of St Agnes in St Paul, Minnesota will hold Requiem Masses in the Ordinary Form on the Evening of November 1 and the morning of November 2, the former with a Requiem setting by Palestrina, the latter by Mozart. Details in the poster. 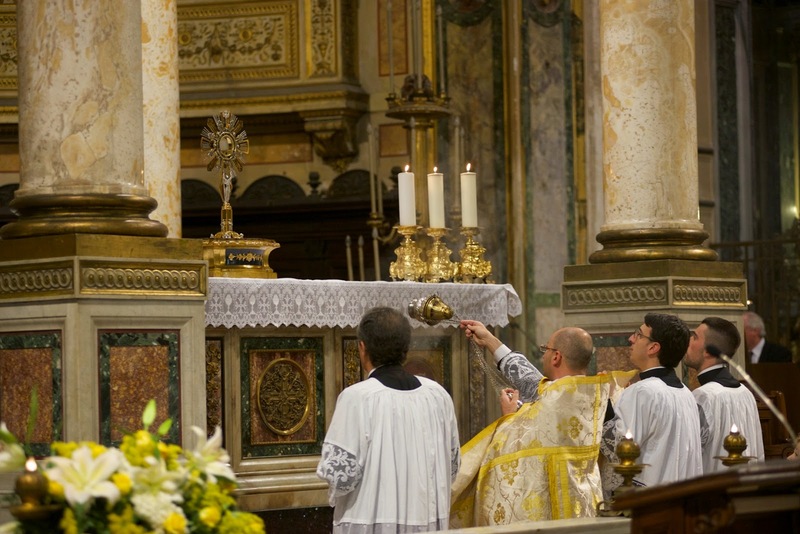 The indefatigable Ben recently noted in foro privato the following quote from Sacrosanctum Concilium : “Zeal for the promotion and restoration of the liturgy is rightly held to be a sign of the providential dispositions of God in our time, as a movement of the Holy Spirit in His Church. It is today a distinguishing mark of the Church’s life, indeed of the whole tenor of contemporary religious thought and action.” (no. 43) These words were written in 1963 with an optimism that for many turned to bitter disappointment very quickly; I was raised in a very Catholic part of the United States, but one where there was almost no decent liturgical music to be heard at all. So it seems to me at least that our most recent set of posts here on NLM are a sign of something very positive happening in the Church today. We have had an unusual number of requests to publicize liturgical events for All Saints’ and All Souls’, events which will feature the music of Palestrina, Victoria, and Byrd, just to name a few. Of course, such events are still exceptional, but they are less so than they were 30 years ago, and will continue to become more common. If you have the opportunity to go to such a liturgy this weekend, remember to say a pray for those who would love to attend something like it and cannot. Here are two notices from places with special events for both All Saints’ and All Souls’; there will be another post later today for events just on All Souls’. Events sponsored by the St Agnes Institute and Juventutem; see poster below, and the website of the St Agnes Institute here and here. The Brothers of the Little Oratory in San Diego will be singing First Vespers of the Feast of All Saints at Our Lady of the Rosary Church, Little Italy, San Diego at 7:00 pm on October 31, 2014. Fr. Joseph Tabigue, C.R.S.P. will be hebdom. and will give Benediction. 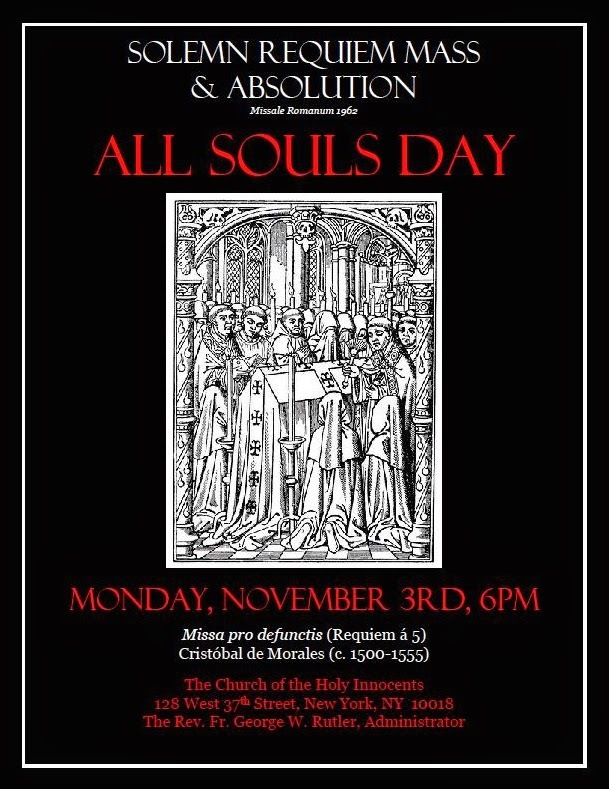 On Monday November 3 at 7:00 pm, the Brothers will sing and serve a Sung Requiem (Missa Cantata) at St. Charles Catholic Church in Imperial Beach, CA. These services are conducted according to the 1962 missal. The public is welcome. Further information on the facebook event page. 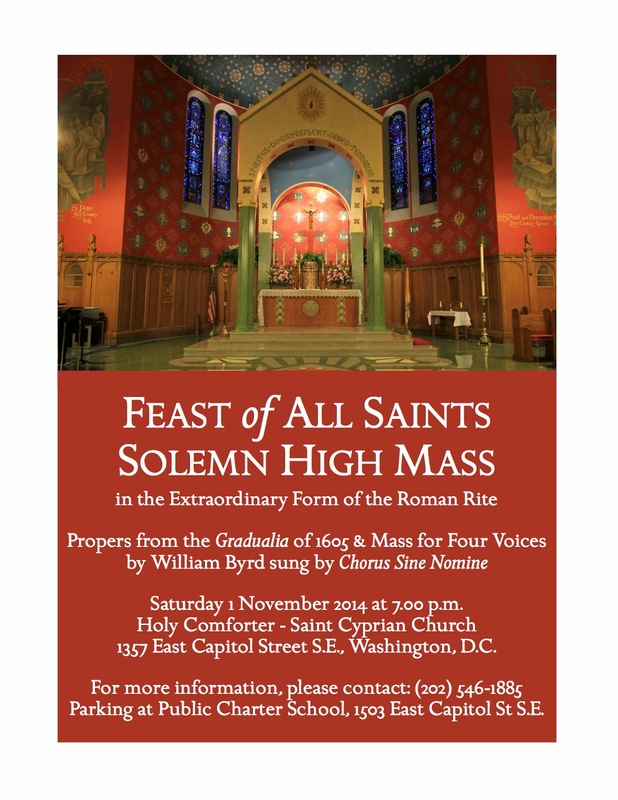 A Solemn High Mass in the Extraordinary Form of the Roman Rite will be celebrated for the feast of All Saints at Holy Comforter-Saint Cyprian, Washington, D.C.. The music, provided by Chorus Sine Nomine, will be the Mass for Four Voices and Propers from the 1605 Gradualia, both by William Byrd. The Celebrant and Homilist will be Fr James Bradley. Free parking is available at the Public Charter School, 1503 East Capitol Street S.E. As November 2 falls on the Sunday this year, Saint John Cantius Church in Chicago will offer Masses on two different days to remember the faithful departed. 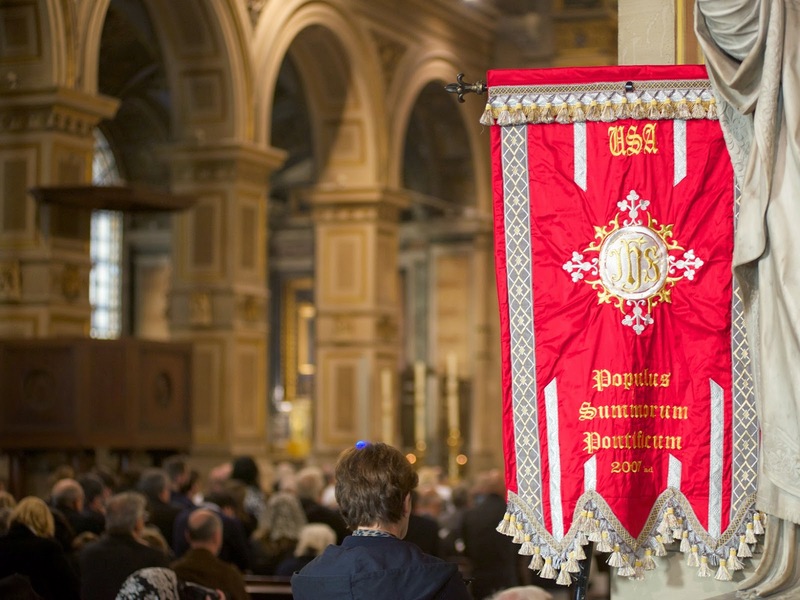 On Sunday Latin Mass will be offered in the Ordinary Form and on Monday Pontifical Latin High Mass will be offered in the Extraordinary Form with Mozart's setting of the Requiem. 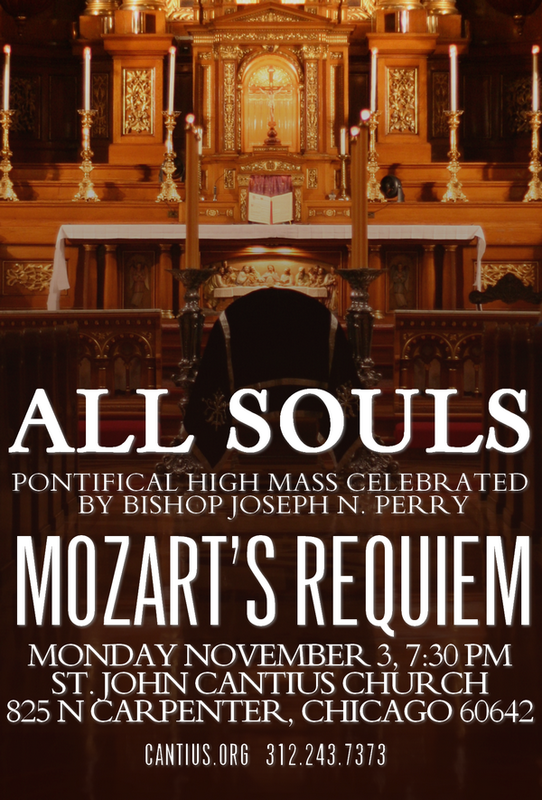 Each year, the annual Mozart Requiem draws Catholics and non-Catholics alike to experience the rich heritage of the Catholic church's liturgical ceremonies and sacred music. 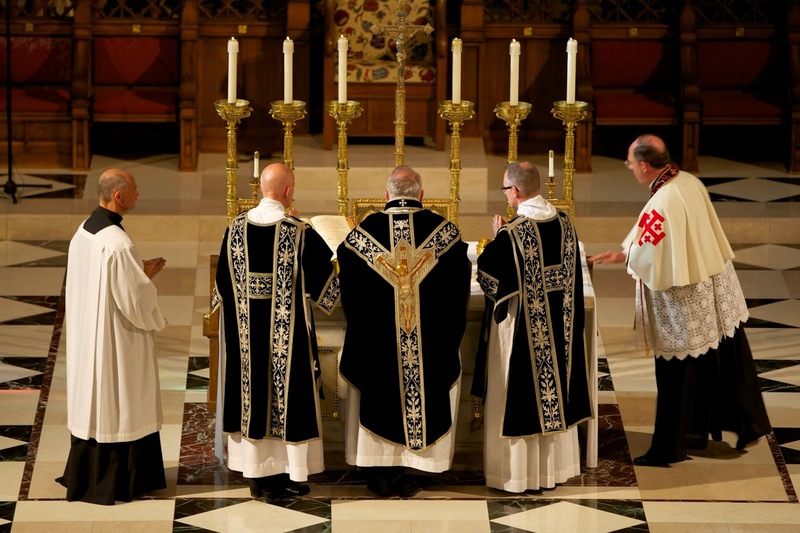 Indeed this year, the Archdiocese of Chicago's Young Adult Ministry website has made the Pontifical High Mass a featured event for young adults. Their website says: Nothing could more aptly be called 'epic'. Celebrant and Homilist - Rev. C. Frank Phillips, C.R. 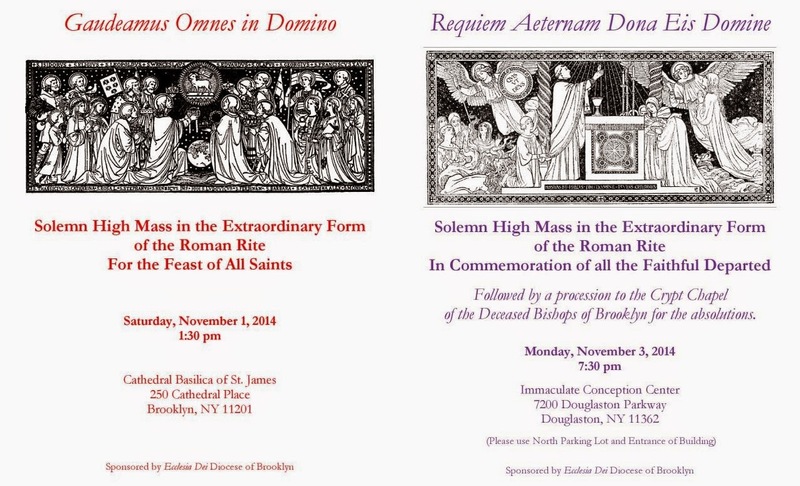 Solemn Requiem Mass, co-sponsored with the New York Purgatorial Society and the Society of St. Hugh of Cluny, will be offered next Thursday, November 6th at the Church of St. Agnes in Manhattan. The Mass will be offered for our deceased family members, friends, and fellow artists. Please send names of intentions in a reply to this email. All the names will be given to the priest offering the Mass, and placed in the catafalque. 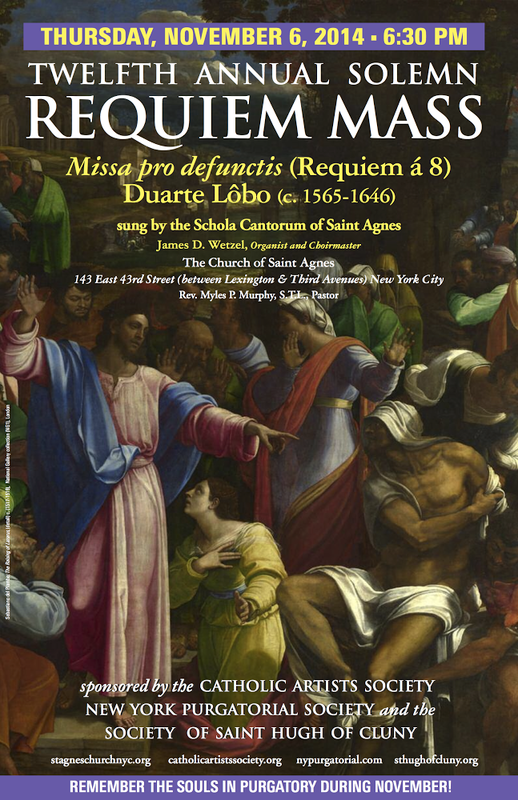 The Schola Cantorum of St. Agnes, led by James Wetzel, will sing Duarte Lobo's glorious Renaissance setting for 8 voices, Missa pro Defunctis (Requiem à 8). On Sunday. November 2nd, for the Commemoration of All the Faithful Departed (OF), the church of St Mary, Help of Christians, in Sleepy Eye, Minnesota, (Diocese of New Ulm), will celebrate a sung Mass starting at 6:15 p.m. The Requiem of Gabriel Fauré will be performed by choir, chamber orchestra, organ and soloists. The church is located at 636 1st Avenue North; contact information here. In Norwich, England, His Excellency Alan Hopes, Bishop of East Anglia, will celebrate a Pontifical High Mass in the Extraordinary Form on All Saints’ at 12:00 p.m., in the Cathedral of St John the Baptist. (Visitor information here.) 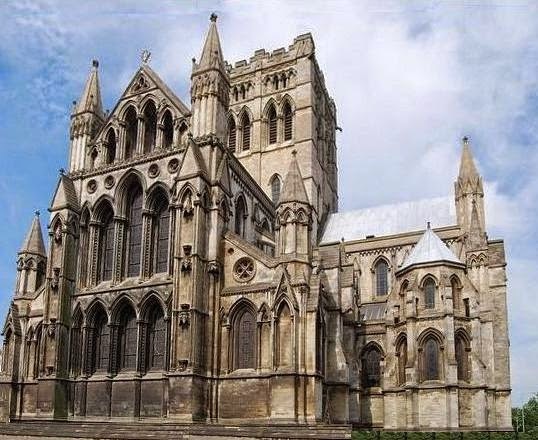 This will be the first time that a bishop of East Anglia celebrates the EF in the cathedral as such, since the diocese was only established in 1976. 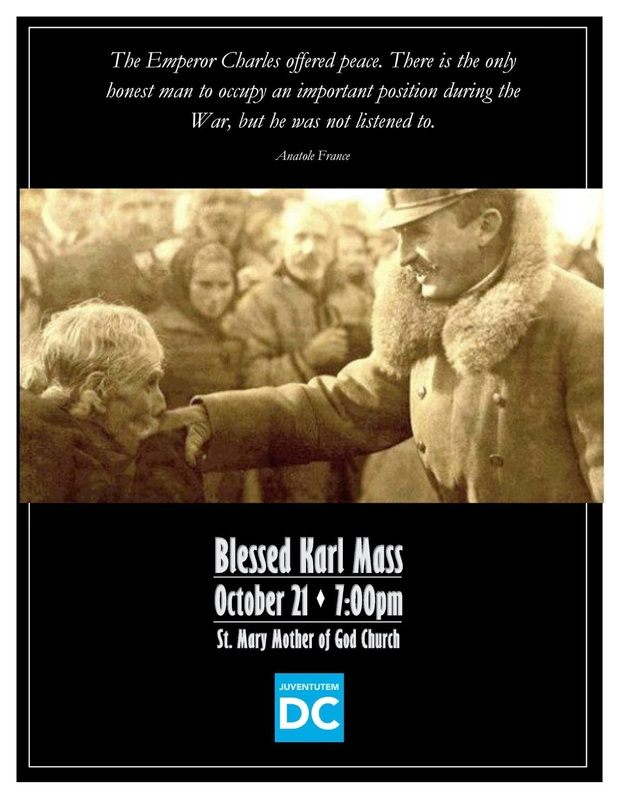 At St Martha’s Church in East Providence, R.I., (2595 Pawtucket Avenue), there will be a Missa Cantata for All Souls’ Day at 7:00 p.m., with music provided by seminarians of the Diocese of Providence, the first Mass to be said in the Extraordinary Form at that church since the late 1960s. St. Paul’s Choir School, located just off the Harvard campus in Cambridge, Massachusetts, has recently released a Christmas album with AimHigher Recordings (Universal), a sister label of De Montfort Music, which is trending to the top of the classical charts. The school has also been the subject of a few shows on EWTN, most recently the latest episode of the The World Over with Raymond Arroyo. Check out the excellent profile of the school and boys in the clip below. An episode of Extraordinary Faith also featured the school a few months back, and the complete episode is available on EFTV's website. I pleased to let our readers know that the Dominican student friars of the Western Dominican Province will be singing and serving a public Dominican Rite Mass for the First Saturdays of November. The celebrant will be Fr. Bryan Kromholtz, O.P., of the Western Dominican Province, a professor of systematic theology at the Dominican School of Philosophy and Theology, Berkeley CA. As this First Saturday is the first class feast of All Saints, the Mass will be of that day, although it will still fulfill the requirement of attending Mass and receiving Communion for the First Saturday Devotion. This Missa Cantata will be at Saint Albert the Great Priory Chapel, 6172 Chabot Road, Oakland CA, 94618, November 1, at 10:00 a.m., and recitation of the Marian Rosary will immediately follow it. Visitors and guests are welcome; pew booklets with the text of Mass in Latin and English will be provided. Those driving to the Mass may park in the Tennis Court Parking Lot next to the chapel. St. Albert the Great Priory is three blocks from the Rockridge BART station, just go north three blocks to Chabot Road, turn right and walk half a block and you will see the chapel on your right. A CD of the Mass of St Philip Neri composed by Paul Jernberg is now available from www.pauljernberg.com. Paul is Composer in Residence and Choir Director at Thomas More College of Liberal Arts and Musical Director at St Lucy's and St Monica’s churches in Methuen, Massachusetts. The whole Mass is sung - so the priest intones, and the choir responds on behalf of the congregation. The recording has been done by the Chicago-based Schola Cantorum of St. Peter the Apostle, under the direction of conductor J. Michael Thompson. 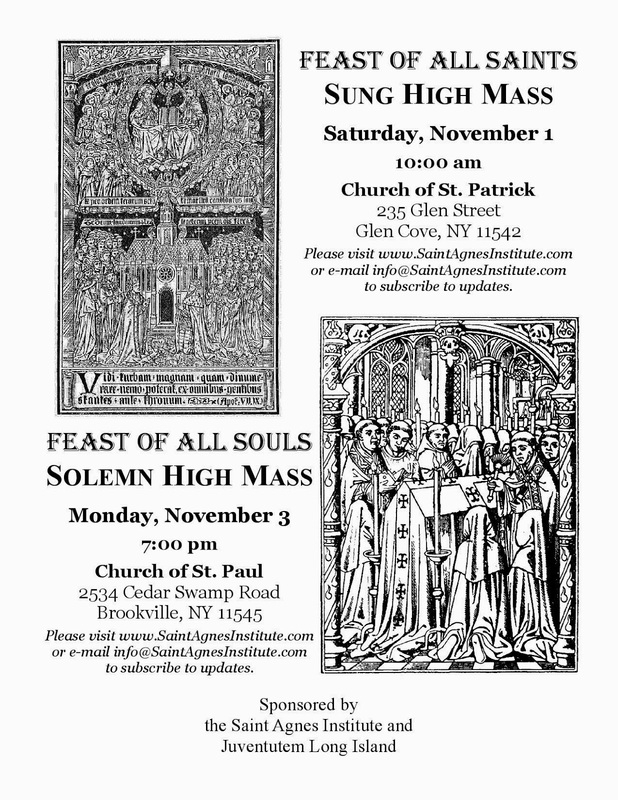 Coming up this weekend, we have two big feasts of the church coming up: All Saints and All Souls. 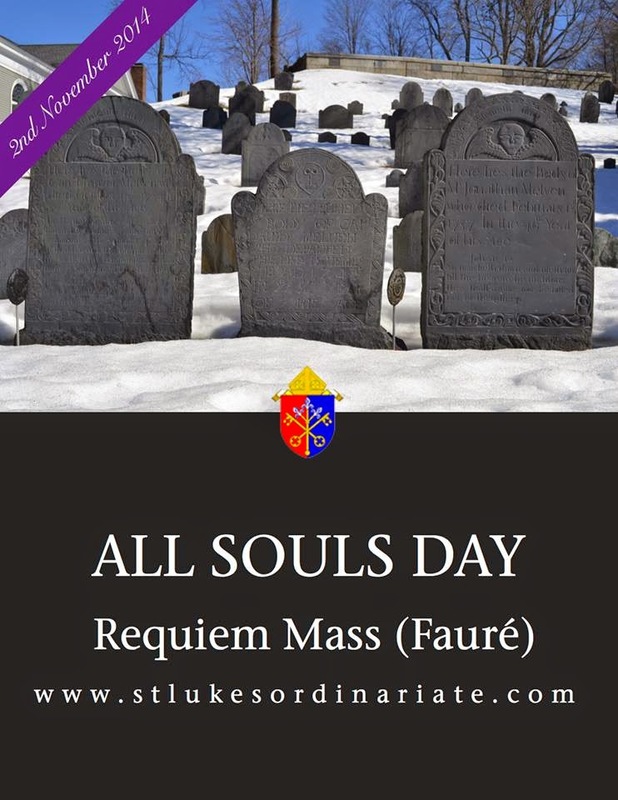 Saturday will be All Saints in both calendars, Sunday will be All Souls in the Ordinary Form, and Monday will be All Souls in the Extraordinary Form (because it is never celebrated on Sunday in the older calendar, so it is moved). Please send in your photos for these three days to photopost@newliturgicalmovement.org. While studying documents which are almost 1000 years old, a colleague from Sweden asked him about the particular handwriting style of a well-known monk, Adémar de Chabannes (c. 989-1034). 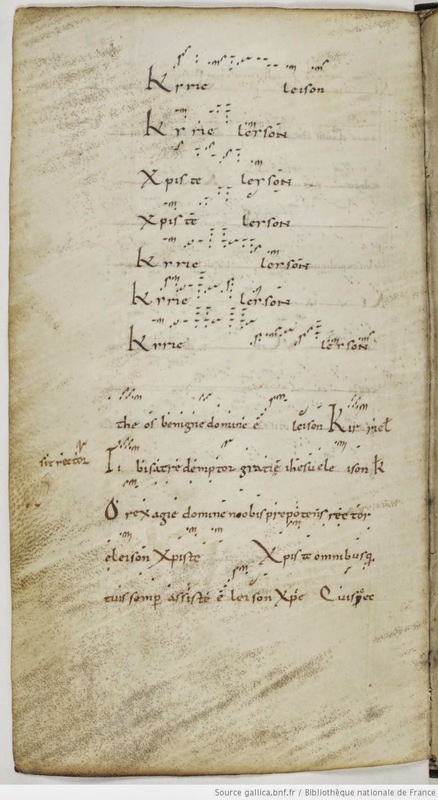 It seems a section of the musical manuscript text was written by Adémar. The handwriting was confirmed by another colleague from Boston who was studying the monk for historical reasons. Suddenly Professor Grier realized that not only was that passage in the monk’s handwriting, but also the musical notation in that passage, and indeed throughout the entire manuscript. The discovery has been reported in Journal of the American Musicological Society. You can read the full article, and listen to an interview with Prof. Grier explaining the discovery and its importance, by clicking this link to the original article. A page of a book of tropes and proses written by Adémar de Chabannes and his uncle Roger, who was the cantor of the Abbey of Saint Martial in Limoges. Above is the simple Kyrie of the Mass with notation; below, the Kyrie with tropes. Bibliothèque National de France, Latin ms. 1084, late 10th century. 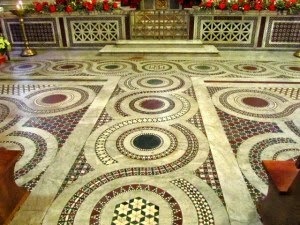 College Student Commissioned to Design a Cosmatesque Floor by Her Home Parish in Driggs, Idaho. Here is a heartening story that went out in a recent newsletter from Thomas More College of Liberal Arts. 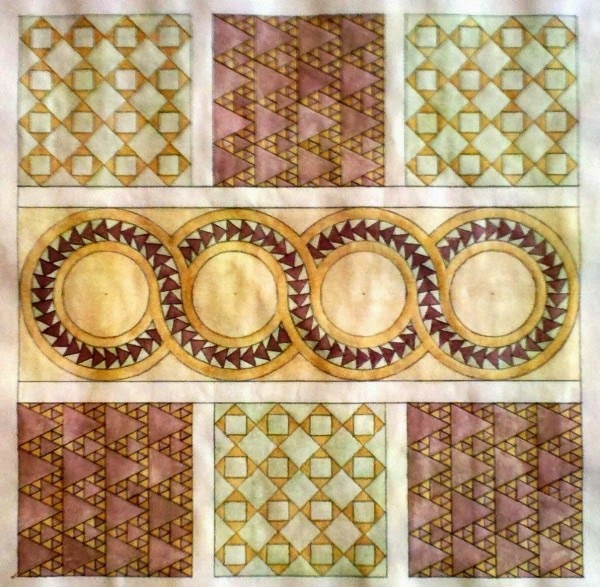 I have featured design work by students at the college before, (see here;) now one of those featured, senior student Amy Green is designing a Cosmatesque floor for her parish, Good Shepherd Catholic Church in Driggs, Idaho. 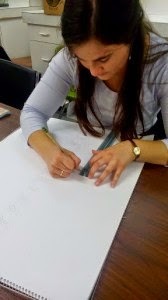 She is doing this through the weekly Guild of St Luke art class at the college. The article below was written by student Marlene Schuler, Class of 2017. In this Amy describes how this will be done through members of the parish volunteering their time to lay the tiles. She told me in addition that these professional tilers had also managed to negotiate a deal with the tile supplier, who offered them a good price simply because he was intrigued by how unusual this project is. This is the sort of result that makes it all worthwhile for me. I’m sure Amy will do a great job! Another point is that, although the article doesn’t say so, as this is done on a limited budget, they would welcome donations to go towards the finished floor. So here’s your chance to contribute to the rebuilding of Catholic culture. Contact me if you would like to donate and I will put you in touch with Amy and the church. In the second semester of freshman year, Mr. Clayton focuses in on Euclid’s geometry and how it is applied in various art forms. At the end of the semester, we were asked to design a Cosmati floor using the techniques we were taught through the program. I was so struck by how easy this project was and how beautiful the floors turned out; which was incredible for me, because I have never been able to draw. Currently, I am taking the St. Luke art guild in which Mr. Clayton is able to help me with the design of the floor! I’m in the middle of designing the floor right now. Once I finish the design and our parish has raised the necessary funds for the floor, the project will begin. There are several parishioners who have offered to donate their time, talents, and materials to lay the floor. It’s going to be local parishioners and people from our town (including non-Catholics) all working together on the floor, cutting and laying the tile…. it’ll be like medieval times, when everyone from the village helped out. I am also designing a website whereby people can donate to the project to help purchase the tile. I am hoping to have the website up and running by the end of this semester. 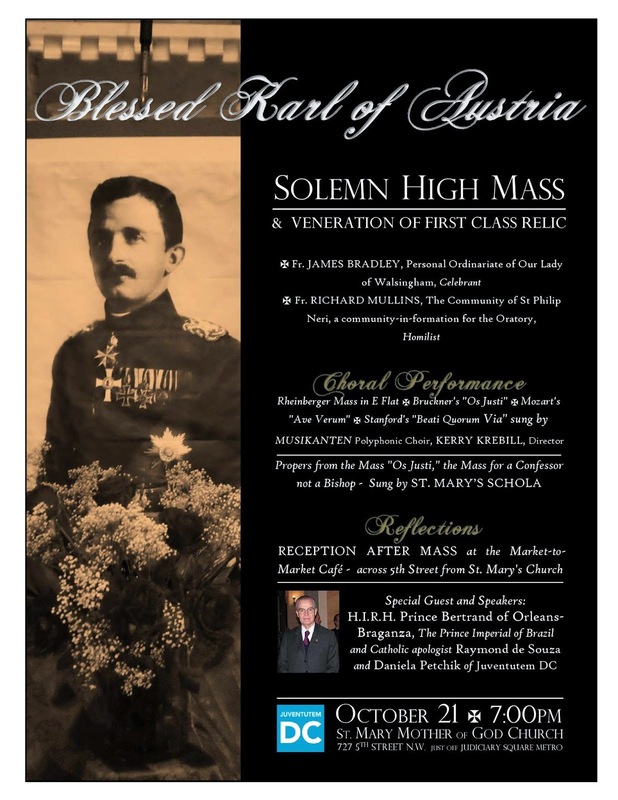 Why are we honoring Blessed Karl of Austria? Why celebrate his memory? He’s not a typical saint. He’s not an ascetic or religious, or a great missionary. Why has the Church raised him to her holy altars for veneration? He was a king—but don’t be misled by his royalty. The fact that he was royalty was a hindrance, not a help. Often the marriages of royalty are ones where the husband disappears off to conduct business. And how many monarchs had affairs? Bl. Karl never did that. What is unique about his royal marriage is that it seems it was a marriage of love and commonality of mind. In fact, his royalty made it a lot harder for him. There are few royalty who are canonized. Several queens make the list, but it is threadbare for actual ruling monarchs: St. Louis the King of France, St. Edward the Confessor, St. Wenceslas. Or Bl. Karl’s first predecessor, St. Stephen of Hungary, whose crown Bl. Karl received when he ascended the throne. Let’s understand the magnitude of that. How many monarchs have there been over the last 2,000 years? So few are canonized—and most monarchs are not worth canonizing. Rather than being saints themselves, often they have made saints by creating martyrs: St. Thomas More, St. John Fisher, St. Stanislaus. “Will no one rid me of this turbulent priest?” was said of St. Thomas Becket. More often monarchs are doing that kind of thing rather than living the kind of life Bl. Karl did. On top of that, Bl. Karl had a war to conduct. Then, after it was over, he had nothing at all. He had to flee the country. Why am I, a Juventutem leader, giving this message? Look at Bl. Karl’s youth: he died at age 34 after ascending the throne at age 29. (His wife Zita was 24.) Why is he a model for us? How much devotion, sacrifice, and service he accomplished as a young adult! He worked tirelessly for the Faith in this life and he intercedes for us in the next. Likewise, it is the young people who will be starting families. We can relate to him on that level. Men, try to model yourselves on what he did. Women, focus on raising such men. There is a way you can relate to this saint even if he was royalty. Raising a family is something he has in common with us regardless of our station in life. This is when monarchy is at its most effective—when monarchs behave in morally admirable ways. Why was Queen Victoria so beloved? Her moral rectitude. Why is Queen Elizabeth II so popular? You never have to open the papers and wonder if you will find something awful she did. If a leader is supposed to lead—lead other people—it is hard to expect other people to behave the right way when the leader isn’t living a virtuous life. Their effectiveness is compromised somewhat—and this is true whether you’re the leader of a university, a company, or a lay Catholic group; or you’re a diplomat, in the military, or work for the government. Bl. Karl also studied law and political science in Prague, so let’s not forget lawyers and politicians. Why is it so important to honor Bl. Karl? For starters, he was enough a man of our age, within living memory. We have films of him. There are people living—perhaps some of them in this room—who were alive when he was. In some ways he is one of the last survivors of a dying age, the old Europe, that is still around. He was also around for the birth of the new one. We also honor him for his family life. He was a successful husband and father. How many of our saints are husbands and fathers? Not many. Most saints are vowed religious. There’s nothing wrong with that of course but it’s nice to have a few that are lay faithful. It’s necessary that there be saints who are accessible to us, in our state in life. The most important reason we honor him is for his heroic virtue, his sanctity of life. 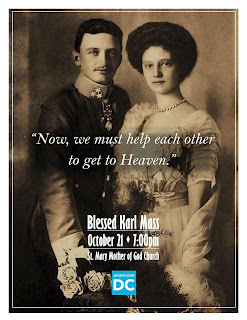 As he told Zita on the eve of their marriage, “Now we must help each other to attain heaven.” Even with professional concerns Bl. Karl focused on his children. When they were very young he would carry them into the chapel, fold their tiny hands, and help them make the Sign of the Cross. He led them in morning and evening prayers. He told them stories of religious history and the life of Christ. He used every opportunity to deepen their faith. For what purpose has God given you an eternal soul but for you to become a saint? 4. Encourage your neighbor in all that is good, and gently draw him away from anything that is bad. Bl. Karl arranged for the troops to attend Mass and receive the sacraments as often as possible. He provided them with wholesome reading material and recreation centers to discourage immorality during their free time. If he heard that a soldier was falling into sin in a certain place, he would have him transferred somewhere else. Juventutem DC exists for the sanctification of youth united in the Catholic Faith and expressed by a love of the Church’s traditional liturgies and spiritual formation, particularly spiritual and corporal works of mercy. These are expressions of the Faith that would have been familiar to Bl. Karl. In fact the form of Mass we attended tonight was the only that he, or most all saints, ever knew. On behalf of the DC and Michigan chapters we hope to see you, young and old, at our March for Life Juventutem Mass and social. Bl. 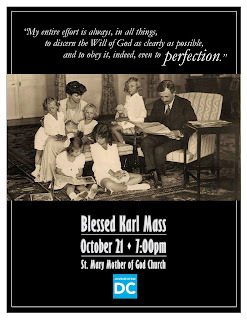 Karl wore many hats: king, emperor, husband and father in very difficult circumstances. He had so many more demands than we do, and then lived in poverty in exile with only the clothes on his back. That’s a very hard thing to do—and yet he never wavered, never shook from his purpose. His entire life was a great tragedy, and yet it was a great victory too. He never lost his faith and he passed it on to his children. He was steadfast to the end and led an exemplary life. Now he can intercede for us in heaven, as his children. 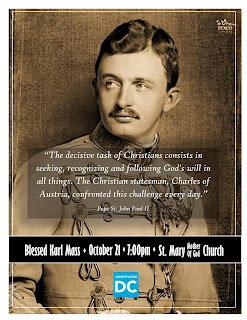 Blessed Karl, Emperor of Austria, and Servant of God Empress Zita, pray for us. I noticed recently a couple of fine NLM-pertinent posts by Dom Mark Kirby, Prior of Silverstream, whose blog Vultus Christi is an ongoing source of refreshing spiritual wisdom. In the attention given to Pope Paul VI in the time leading up to his beatification, one notices a deafening silence on those many respects in which this pope either was, or at least seems to have intended to be, a proponent of the “hermeneutic of continuity” avant la lettre. While it’s true that Paul VI is a complex and even at times contradictory figure who contributed to the problems inherited by his successors and all of us (see my earlier article on this very subject), it is only a matter of plain common honesty and justice to paint a fair portrait that includes elements essential to modern-day traditionalism. These would have to include not only Paul VI’s Humanae Vitae and Mysterium Fidei, but also his unambiguous reaffirmation of the Catholic faith in the Credo of the People of God and his 1966 Apostolic Letter Sacrificium Laudis, whose defense of the traditional choral office in Latin deserves to be much more widely known. 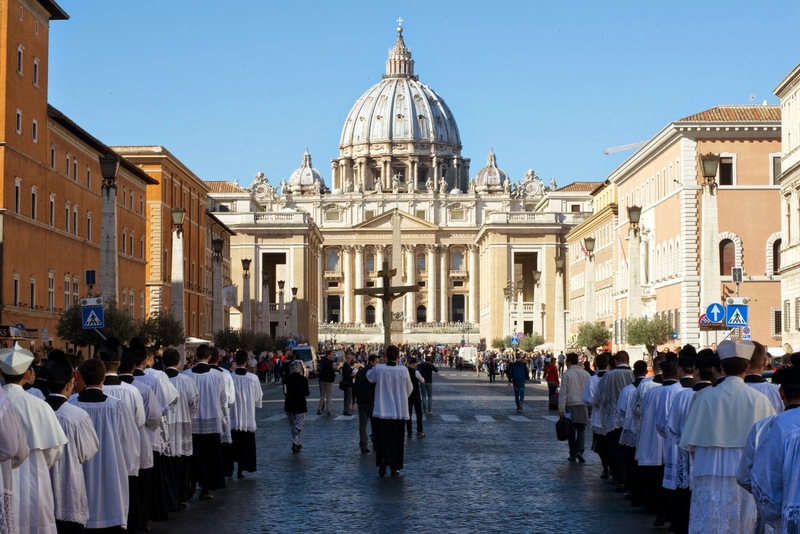 Dom Mark offers the complete text of this short Apostolic Letter, along with an introduction. Highly recommended. Dom Mark also devoted a daily reflection (again, with the complete text of the document) to how important the Credo of the People of God was to him in his personal life as a monk living in a confused and volatile period. Published less than a month before Humanae Vitae, the Credo was perhaps the most quickly buried and forgotten document in the history of the Magisterium. It is nevertheless worth revisiting, and is sure to raise more than a few eyebrows when one sees how the creed Paul VI professed, unambiguously reiterating dogma on faith and morals, has been slowly and consistently undermined in subsequent decades. While we’re speaking about Paul VI, I would like to recommend to NLM readers a newly posted article by my colleague, Dr. Jeremy Holmes, “Saving ‘Pastoral’ from the Wolves”. We are all rightly disturbed, I think, by the serious abuse that has been made of the term ‘pastoral’, and how many acts of negligence and deviations it has covered since the Second Vatican Council. We might, in fact, be tempted to throw the word away. But we do not do well to let the enemies of the Faith seize hold of vocabulary and claim it as their booty. As the Sensible Bond likes to point out (in league with George Orwell and Josef Pieper), language is power, and abuse of language is abuse of power. Dr. Holmes examines the authentic notion of the pastoral, that which has to do with the shepherd truly taking care of his flock by taking them seriously and yet leading them where they need to go. There are some interesting liturgical and moral examples. Check it out. Yesterday, His Eminence Raymond Cardinal Burke, Prefect of the Apostolic Segnatura, celebrated a Pontifical Mass in St Peter’s Basilica for those participating in the Populus Summorum Pontificum pilgrimage. The day began with Eucharistic Adoration at the Basilica of San Lorenzo in Damaso, followed by a long procession through the streets of Rome, which crossed the bridge at the Ponte Sant’ Angelo to reach the Vatican. The Mass was the Saturday Votive Mass of the Virgin Mary, and His Eminence preached on the Virgin Mary as a model of our lives as pilgrims in this world. Music was provided by a choir of almost 20 seminarians from the North American College, conducted by Mr Leon Griesbach, accompanied by Mr Garret Ahlers on the organ. I am very grateful to Mr François Nanceau for providing us with links to these photos. (I was unable to take any myself, since I was the 2nd MC!) You can access the complete set on googleplus by clicking here, and on facebook by clicking here. 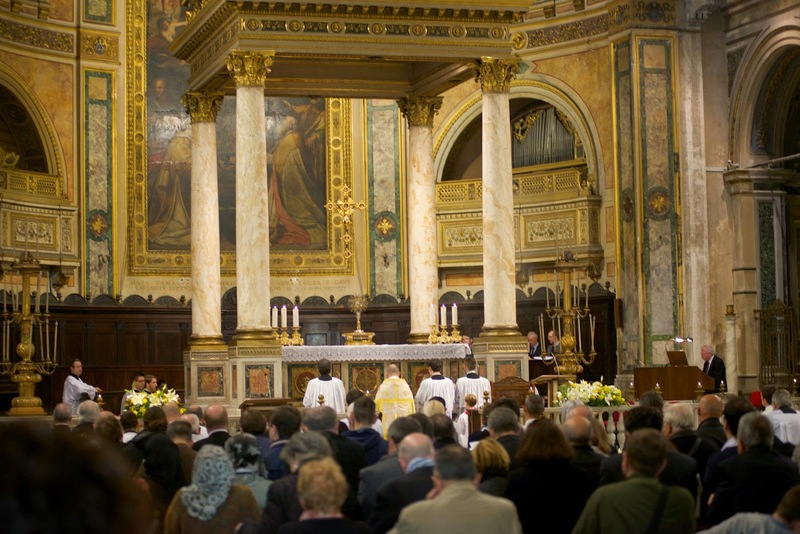 He has also posted photographs of the Vespers celebrated by Archbishop Guido Pozzo at Trinità dei Pellegrini (here and here), and the Mass celebrated there on Friday for the feast of St Raphael and the 10th anniversary of the International Juventutem Federation (here and here). All photographs copyright François Pierre-Louis for Coetus Internationalis Summorum Pontificum. Why is the Feast of Christ the King Celebrated on Different Sundays in the OF & EF Calendars? A happy feast of the Kingship of Our Lord Jesus Christ to all NLM readers! Earlier this week at Rorate Caeli, I published an article concerning the transference of this feastday from the last Sunday of October (where Pope Pius XI had originally placed it when he instituted the feast in 1925) to the last Sunday of the liturgical year in the Ordinary Form, which falls at the end of November. Sometimes one hears conservatives who have not studied the subject say: "The differences between the old and new Roman calendars are not so very great; most of the major feasts stayed where they were, some obscure old saints were removed and a number of more recent saints added." But the Feast of Christ the King is a particularly striking example of a major difference, and one that certainly has theological reasons behind it. In my article I attempt to show what's at stake -- and, not surprisingly, it does have a profound relevance for the very issues that are now tossing the barque of Peter like a cork upon the waves. Yesterday evening, the crowd of pilgrims who attended the Mass at the FSSP’s Roman parish, Ss.ma Trinità dei Pellegrini, was simply too big for me to get near the altar to take any good pictures of the ceremony; the church was literally full to overflowing. People will be sending me pictures, and posting them elsewhere; I will post them as they become available. His Eminence George Cardinal Pell was to be the celebrant of the Mass, but was taken ill, and so the Mass was celebrated by his secretary; please be so kind as to say a prayer for His Eminence’s recovery. His secretary read the homily which the cardinal had prepared, which I hope to have available shortly. For the opening of the Populus Summorum Pontificum pilgrimage, His Grace Archbishop Guido Pozzo, Secretary of the Ecclesia Dei Commission, presided over the celebration of a Votive Vespers of St Raphael the Archangel, one of the patrons of pilgrims and travelers. The music was provided by a choir of seminarians of the Institute of the Good Shepherd, directed by Fr Matthieu Raffray, accompanied also by organ and recorder. Here is a small portion of the Vespers, the fifth antiphon and psalm, and the chapter. (Pictures below). Aña Peace be with you, fear ye not; bless God, and sing ye unto him. The church was packed (this photo was taken before the ceremony began, a lot more people came in before the Vespers started.) Everyone sang the psalms and the hymn, alternating with the choir; the Magnificat was done in a particularly good polyphonic setting with recorder and organ. The altar decorated with a picture of St Raphael and Tobias, which is normally in the sacristy. One of the coped assistants brings the text of an antiphon to be intoned by a priest in the choir.